ModelBuilder Create Tin gives ERROR 000800? I'm building a model that iterates through several feature classes. Part of the process is creating a TIN from polylines. When I run the model inside the editor it executes correctly without a problem. When I execute it outside of the editor by double clicking, what happens is it will run through the first feature class correctly but then throws this error on the second iteration and fails the tool. Here are the inputs of the Create Tin tool. 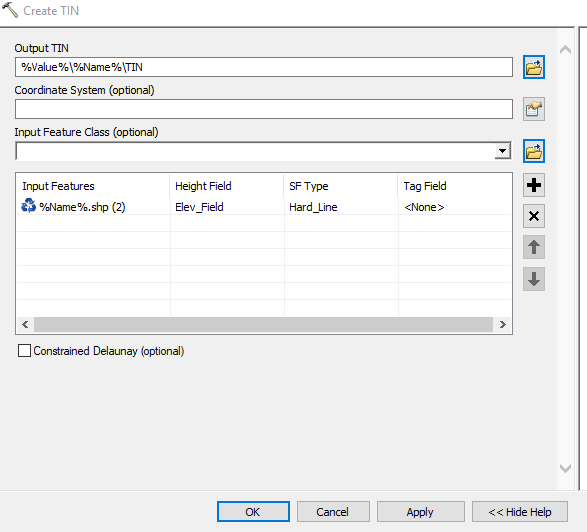 Browse other questions tagged arcgis-desktop modelbuilder 3d-analyst tin error-000800 or ask your own question. Using Add Join while iterating feature classes in ModelBuilder? Setting creation of feature dataset as precondition to iterative process using ArcGIS ModelBuilder?